It’s terribly disappointing to carefully set your oven and timer to bake your polymer clay project, but then find that your hard work is browned and dark when it comes out of the oven. Many clayers bake all their projects at lower temperatures to prevent this from happening. Is this a good idea? Is it fact or fiction that baking polymer clay at lower temps will give better results? Polymer clay is PVC powder mixed with plasticizer and some other stuff (fillers, binders, pigment, etc). And as the heat in the oven rises, the PVC particles swell up a bit and soften, eventually fusing into a solid mass that we know as cured polymer clay. You need to bake the clay long enough and hot enough for this fusion to occur AND for those particles to fully fuse together to form a solid mass. If you bake at a lower temp, the particles don’t soften enough to fuse well. Also, if you bake for too short of a time, and the particles won’t have time to fuse well. You need both time and temperature. The instructions on a polymer clay package are not written to give the best possible conditions for optimum results. They’re actually guidelines written to give the best results to the most people. Because newbies and occasional crafters won’t necessarily have a calibrated oven, the instructions are aimed to prevent burning and scorching for an oven that may very well be grossly inaccurate. This means that the instructions on the packages of polymer clay are the minimum times and temperatures that you should use. Yes, I realize that some packages warn against baking at higher temperatures, but remember that the dial on your oven often has little relation to the temperature that’s actually inside. Polymer clay can burn, of course, and that’s what you want to avoid, but it actually won’t happen unless the real temperature inside the oven is close to 350°F (177°C). If you have burning when your oven is set to the correct temperature, then your oven is inaccurate. This could be due to a faulty thermostat. Or, your oven could be “spiking”, which is when the heating element cycling on and off will make hot spots on the surface of your clay, leaving the surface burned and the inside underbaked. Baking at a lower temperature to prevent this from happening will not necessarily give you a complete cure. Even if your clay project looks just fine, underbaked clay will be weak and brittle. If your polymer project breaks, always suspect underbaking as the most likely cause. Baking polymer clay at lower temps is not the solution to preventing burned projects. Get a separate oven thermometer to make sure your oven really is heating to the temperature you tell it to. Adjust your dial to give you the correct temperature according to the thermometer inside. Cover your work with a lid, or a piece of foil or cardstock to protect your work from the heat and to help prevent color changes. Even a properly functioning oven’s heating element will often get very hot as it cycles on and off during the baking period. Covering your work is simple and prevents disappointment. Longer baking times CAN compensate for lower temperatures, but only to a certain degree. On the other hand, longer baking times (and to an extent, higher temperatures) do allow for more complete fusion leading to a stronger finished product. Most brands of polymer clay are remarkably stronger when baked longer than the duration that’s suggested on the package. Most professional clayers bake their clay for at least 45 minutes, and often much longer for thicker pieces. A drawback of cooking hotter and/or longer, however, is color changes. Reds can darken, trans can turn brown, and white can turn tan. This is not the same thing as burning. But these color changes are the limiting factor for how hot and/or how long you can bake your polymer clay. It’s all a balancing game. You need to find the best temperature and setup for your oven, your brand and color of clay, and the kind of pieces you bake. And that may very well mean that the setting you turn your oven’s dial to might look very wrong. 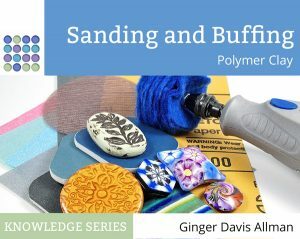 To learn more about baking polymer clay, including what kind of oven to use, how to select the correct temperature, how long to bake your polymer clay, and many more tips, make sure to read my articles on Baking Polymer Clay. Hi Ginger Davis Allman please can you help me! In England UK our kitchen ovens highest tempriture level is 250f, but Supper Sculpey bakes at 275f… I have a small piece of sculpture manly quarter inch thick, and half an inch in places, its packed out with aluminium foil and wired to an armature. My clay is Super Sculpey Medium Blend Oven Bake Clay. Can I bake this for longer at 250f, if this is possible how long do you recon I need to add on to the Sculpey guidelines of 275f. I have searched everywhere for this info but cannot find an answer? Thanks for your website info on using Polymer Clay very helpful. Hi Howard, are you sure that you’ve got your Fahrenheit and Centigrade right? 250°F is quite low, you’d be unable to bake your pudding at that temp! Unless your oven isn’t working properly, it will go quite high enough. You need to bake all of the Sculpey clay products, all varieties, at 275°F, which is 135°C. Have another look at the knob on your cooker and you’ll most likely see numbers that are in the 100’s…that’s perfect. Set it to 135 and away you go! You’re right about color changing. I bake at tempratures between 130 and 140 Celcius at least for 1 hour. I noticed that Fimo white changes color, after baking it turns into sort of ”very light pinkish skin” color. I contacted Fimo Belgium about this issue and they told me its because of baking higher then the recomended 110 C. I did a test with all makes of white I have; Pardo, Premo, Cernit, Kato, Fimo, LC clay and Clayologie. I made strips out of every white, on all the settings of my dream machine. I baked the clay on different temperatures, starting at 110 then 120, 130 and 140. Fiimo white indeed doesn’t change at 110 C, but the result is very weak, one time bending, is enough to break it. At higher temperatures Fimo white is not white anymore. Anyone else who noticed the same? I’ve used polymer clay for a few years now and I’ve never had any problems with it until this week. For some reason my fimo soft clay is melting in my oven… The first puddle was cooked for 20 minutes at 275 degrees Fahrenheit, the second for 15 minutes at 230 degrees Fahrenheit, and the third I tried 15 minutes at 175 degrees Fahrenheit. All three ended in a pan-ruining mess of a puddle… Each piece was made with newer clay than the last but the newest clay I have is almost a year old. Please tell me what I’ve done wrong. Polymer clay will not melt at any temperature. It sounds like a case of mistaken identity and I suspect you have plasticine modelling clay. In most craft stores, the modelling clay is displayed near (and intermixed with) the polymer clay, so it’s very easy to grab a package of the wrong stuff. Plasticine will melt into a puddle when heated. If you still have the wrapper and it says “Fimo Polymer Clay” and the instructions say to bake in the oven, then something is very wrong and you should contact the manufacturer.